Ralph Douglas West is the founding pastor of The Church Without Walls (Brookhollow Baptist Church) in Houston, which has grown over the past two decades from 32 members to more than 21,000. West will be one of the featured preachers at the 2009 National Conference on Preaching in Tampa, Florida. Recently he sat down with Preaching editor Michael Duduit to discuss his own approach to preaching. Preaching: I love the name of your church—The Church Without Walls. Where did that name come from? West: Well, I actually thought I was being clever. I preached a sermon 20 years ago from the Book of Acts, and I used this riff where I referred to how the church met door-to-door or house-to-house outside. And I stumbled across the phrase, "It was a church without walls." I actually thought I was being very clever at that moment. I later discovered that it was a term that missiologists would often use; one of the mission professors at Princeton, back I think in 1956, wrote a little book on missions entitled The Church Without Walls. And Peterson wrote a book on the church without walls. So I used it then as being a validation that I at least had tradition and history on my side, that it was a good, biblical, ecclesiological term. Preaching: It says something about your church, too, in terms of its role in the community. West: Yes, it does. One of the themes that it highlights is that it’s limitless in possibility, and beyond that it’s open to all people. We use these terms "open to all people"—they sound catchy and ecclesiological and evangelical. We get to certain places, and it’s anything but open to all people. But "all people" means just that—socioeconomic backgrounds, different gender, cultures, people with different beliefs and ideas. And hopefully those people who come would be transformed by the preaching of the gospel of Jesus Christ. Not trying to make them into "Church Without Walls" people but to truly make them citizens of the Kingdom of God. Preaching: Tell me about your church. West: Our church celebrated 20 years in November of 2007. We began with 32 people. It was during a very critical time in my life. I was 27 years old, and I was going through a very bad church fight. I mean, it makes me shudder to think how bad it was at times. Now, the irony of it is you would think if it was that bad it had to be something significant that we were fighting about. But we were fighting over trees and carpets. It really came down to a battle about pastoral leadership over tradition. I was called to a church 86 miles east of Houston in the Beaumont-Port Arthur area. I really thought that would be a good way to get out. It felt like a dignified way to transition. To be honest, I would have left for any reason. I told my wife, "We can go here, save enough money and pack up and leave." That was actually my intention. And during the process I spent a significant time in prayer. I had nothing. I was trying to force the move, but it was just not a move to make. I didn’t know anything about planting a church. If you recall, 20 years ago we weren’t using that language, particularly in the African-American tradition—not "plant a church." It was always "you started a church, you split a church." And I didn’t want to split a church. So we actually planted a church—with 32 people—in northwest Houston in an area where there were, let’s say, not a proliferation of churches. And there were no African-American churches out there. Our church began to grow immediately numerically and spiritually. We had key measurements of growth. We stayed in the Brookhollow Marriott Hotel for one year. We found about three miles west of us an old Houston Business Journal building—just a little tin building, 18,000 square with 1.3 acres of land. And it had land around us, but it was an industrial community. The church growth experts were saying you couldn’t grow a church in that kind of community. We defied all church growth standards. We grew, grew, grew. We went from one service to two services, three services. We actually ended up doing six services a week. And the building only sat about 400 people or a little more—but we actually would cram 700 or 800 people in there at a time all around the building. People say it’s impossible, but we have pictures to show it! Then the Lord gave us a miracle. Thirteen miles northwest of our facility where our temporary building is located, we found 40 acres of land. Forty acres of land! And we bought it for $114,000. We built a multi-purpose building of about 100,000 square feet with a gymnasium, educational facility, administration, nursery. We’re still in that building. Just recently we purchased south of us another church campus and 30 additional acres of land. It was something I didn’t want to do. Multiple campuses are getting popular now, but it was something I didn’t want to do. It wasn’t part of our vision. We’re trying to build a facility, but our church plateaued. Come to find out we had 1,400 families within three miles of that second campus. So the day we opened up the building, that building filled up. So we’re faced with another building challenge now. The Lord has been good. I say that with all humility—the Lord has really been good. Preaching: Between the two locations, how many worship with you over the weekend? West: We have five worship services. We’ll average in attendance between the five services about 7,500 to 8,000 people. Preaching: Are you physically preaching in both locations? West: I actually go to both locations. I settle down quite a bit during the summer months. I’m relational. I really believe relationship has helped shape our church. The downside of multiple services and different campuses and running the services so close together is it gives you no time to touch people. So much of what I do is beyond the pulpit—touching people. I love standing, shaking hands. It’s almost like a kind of celebrity addiction that the pulpit has now, that we stand off and away from people. I personally believe that more pastoring is done walking through the halls, touching people, speaking to them than all the preaching that you can do. Preaching: Tell me a little bit more about your approach to preaching. What might we see if we were to come to your church on a typical Sunday? West: On a typical Sunday I am biblio-centric. I’m like Spurgeon—I believe in the Bible. I was nurtured that way. My pastor was not a trained pastor in the sense of academics or credentials or seminary, but he was a Bible preacher. I didn’t know anything about expository, exegesis, hermeneutics, homiletical approaches, pattern of preaching style—I didn’t know that. I just remember a man standing up every week, opening the Bible, reading a portion of a passage, a pericope. And he would spend 35 or 40 minutes preaching out of that limited, restricted piece of Bible that he read. I later was mentored by A. Louis Patterson after my pastor died. I’d only had one pastor. So Pastor Patterson took my wife and me in, and he’s been my pastor now for, I guess, 25 years. And he nurtured me. But he was strong on expository preaching. I had no idea that’s what my pastor was doing. And so on any typical Sunday I will limit my sermon to a pericope, and I will allow that passage of Scripture to drive the ideas. The movements, the images, the illustrations come out of that; the dominant and subordinate thought comes out of that. That would be what you would hear on a given Sunday—a stated thesis, a central idea of the text, a major objective of the text. You almost feel in the application where I’m trying to move that congregation—what the behavioral principle would be. I hope that they would become this at the end of that sermon. Preaching: Do you preach in series? West: I do preach series. I preach through books of the Bible and then maybe some idea will come up. In fact, I did a series entitled "Left Behind." It’s not dealing with eschatology. It’s dealing with different passages of people who were actually left behind. In the Genesis 22 passage where the servants were left behind. And the idea of the series is "What do you do when you’re left behind? When you’re looking at a spiritual crisis, what do you do?" Sometimes you just pray and wait. I’m looking at another passage out of 1 Kings 19, where Elijah leaves his prophet behind. I love series preaching. I used to try to preach every verse of a particular book, but I would get worn out. There used to be a time with pastors like W.A. Criswell—when people would preach or join his church, and they’d ask "When did you become a member of First Church?" They’d say, "Oh, I became a member when he was preaching Leviticus or Daniel." I don’t know if the attention span is the same in the culture now. So if I were to preach through a book like 1 Peter, I’d just take selected themes, four, five or six at the most. I love series preaching. It really helps me plan better. Preaching: I interviewed Dr. Criswell late in his ministry, and we were talking about these series. He told me that in the later years he preached through books more quickly than he used to. I think that even for those who preach through books, that tends to be a trend. West: You find a theme and live with that theme. I think it draws people. You’ll end up like Martin Lloyd Jones preaching forever on one passage, you know, which speaks of the inexhaustibleness of the Scripture. Preaching: How long would an average series be for you, and how long does an individual sermon usually run for you? really, really, really happy I may say eight weeks, but I don’t normally do that anymore. And the length of my sermons is about 30 minutes. I may go 35. I’m almost conditioned for that now because of the multiple services I have to be in and out. It’s made me become more economical with language. Preaching: In a situation where you have one service on top of the other, you don’t have much choice. West: No, you don’t. If you run over you have a traffic jam. And you know, that plays a part in how people view church. I think they look at the management of time in the same way they say, "Well, how you manage your time may say something about the way you manage your resource and manage people and manage, you know, your life and everything." Preaching: You’ve been preaching now for over 20 years. Have you seen changes in your preaching during those times? West: I have. There was a time when they said you don’t preach beyond your experience. And so much of preaching was head knowledge—what I’ve read, what I think, this means that. Over the years I’ve been pastoring—for 25 years or so—there’s a lot of lived experience in that. So you see a lot, and you can feel quite a bit. I tell preachers often that you exegete a passage, but you also can exegete a congregation. You look into the face of a person, and I think it’s the gift of discernment that the Lord gives to the preacher, to look and say, "No, with this person don’t be so pedantic. Be a little more practical. They need to hear this now." How do you find application? How do you find the slices of life and make that word live where people are? How do you take it from the pulpit to the pavement? Make it portable for us. Preaching: One of the challenges we preachers have is we love to study. We love the digging into, finding all the different things that you can do. But it’s almost like a director with a film. You end up with lots more film than you can use—lots of it ends up on the cutting-room floor. Where to make the edits is the key. West: Yes, I’m editing right now! I think you makes the edits when you say, "OK, now this will work somewhere else. You’re losing ground preaching that or you’re trying to cover every aspect of this person life’s before you get to this passage." You know, often if I’m preaching through a prophet and I’m taking a passage from the middle of a prophet’s literature I want to spend some time saying this is who this person is. But you can give them a profile without unloading every aspect of a life. That’s what I’m doing right now. I say, "OK, you’ve got to cut this down. You can’t tell all of this. You’re going to lose ground." I think the sermon—when it stops being driven by its central point—you have to burn some of this fuel. You’ve got to let some of this out. You’re right. We’ve studied it. We’ve dug it up, so we want to use it! I know I do. And after all these years of preaching, I still have a lot of anxiety about those 30 minutes to make every minute count. If I’m not careful I’ll start assuming I need to fill in. And I think that’s where you get in danger of losing ground. Better to have a pointed sermon for 15 minutes than one that’s unraveled all over the place for 30 minutes. Preaching: Do you use a manuscript or notes as you preach? West: I actually write a full manuscript, but I don’t take it to the pulpit with me. I used to memorize it, but I don’t do that anymore because that would become restrictive to me. I read a comment Stuart Briscoe made about contemporary preaching. He said that he tries to live in the text until it wears like a worn shoe. I like that. And that’s what I try to do—to live in the text and live it even in that written material, that exegetical work, that illustrative work until it becomes a part of me. It’s not static, and it doesn’t come across as being cold and distant—"OK, I’ve studied this, and this is what I want." I want it to be warm, conversational, proclaimed but conversational—to know that this is something that this person didn’t just study. It’s a part of him now. But I’ll say this—I never sacrifice content for style. If I felt tonight when I get up to preach that I’m not clear on this movement, this thesis, I’ll write it down and carry that with me. I’d warn against sacrificing content for style. For somebody to say, "Oh, he doesn’t use anything." I’m 6'5", and I don’t sight-read well. If I had a manuscript I’d probably put my head down and read word . . . for . . . word . . . the . . . manuscript (laughter). I like to talk, so I feel like I’m more comfortable communicating to people. Preaching: What’s your preparation process like? How long do you typically spend in preparing a message for Sunday? West: It varies. I used to have a pattern—this day I do this and this day I do that. I wish I could say I do that now but I don’t. I still spend no less than about 20 hours trying to write a sermon. I try my best on Monday. I’m tired. I mean, I’m just empty. But I try my best to begin with the exegetical work. I’ll try to read through the Scripture. If it’s New Testament I’ll try to read through different translations. I’ll pull out my Greek New Testament. I still pull it out. I’ll try to read through it. I may stumble through it all the way, but I try to actually dig through it, just getting a read—getting a feel. But I’ll read a variety of English translations. I’ll take all the help I can get to just work through that. Then I’ll start making my own exegetical remarks based on my reading. From that I’ll start saying, "This word means this. This says this." I’m still looking for the grammatical, historical, theological lines. Once I do that I’ll try to find a heavyweight commentary, something that’s going to make me have to pause, read slowly, rethink what I’ve been reading in the Scriptures to try and match what this person’s response to this text is compared to mine. I really enjoy when I come across one of those heavyweights that differs with me. It gives me a chance to put what this person says and what I’ve been thinking into dialogue. Does this word really mean this? Why does he choose this tense of it? I want to try to figure that out. Now I have a dialogue with it, and I’m standing my ground. The commentator is standing his ground. Then I’ll move from that. That’s the biggest part of my work—trying to get the exegesis. I want to be true to the biblical passage. On that same day I’ll try to start writing out a thesis: what did the passage mean, what does it mean? I try to look for the present active indicative statements to start making it live. You can do this—all that kind of stuff. It may change by Thursday, but at least I have a thesis, movements. Also I’m looking at images in the Scripture, saying this is illustrative, should this be explained, on down the line. The hardest part for me is the application—to move it from the then to the now. How do you make this apply in your life? Because I don’t just want to stand up and say, "You can do this, this and this." I want people to leave here saying, "Yes, that’s what this passage means." I still go through that process. And I try to write out the manuscript or write out the sermon in manuscript form so that I can have a reference if I ever need it again. Then it helps me with exactness of language, coherence of thought and pattern, and I’m just not scattered all over the place. Preaching: What do you find to be your greatest challenges today as a preacher? West: One in the personal life is time. How do you balance your time between family and church? How do you balance your time to rest and work? To really find that balance—that’s one challenge personally. I think pastorally one of the challenges is how not to get so bogged down in the urgent that you miss the important. There are so many things that scream and vie for your attention that don’t necessarily need your attention. So how do you make the main thing the main thing? What are the main things? Proclamation and prayer. These are the main things. One thing that goes lacking that is identifiable on Sunday morning when you stand up is if you didn’t have time to prepare. And much of that preparation comes out of the time that we season our soul in prayer. So those become primary—a devotional life and being still. I think those become the big pastoral challenges. It used to be, when I was growing up, there was the Pastor’s Study. Now everything is the Pastor’s Office. Just the nuance of the word makes a difference. Study was a time when you prepare before God, a quiet time. Office was for administration and business. I think that a pastor has to get back to that moment where we protect our time—not to let the urgent scream so loud that it blares out and we end up on Saturday night saying, "Oh my goodness, what do I do tomorrow?" I think another challenge for the pastor is rest. Just resting. I remember I was being interviewed once, and I was giving my pattern of rest. I try to take a day out of the week to do nothing. And then I try to take a day or two out of the month to do nothing. During the summer I try to rest. I remember the person who was interviewing me said, "Well, don’t you think that’s an abuse of time?" And my reply was: "Busyness doesn’t always mean productivity." Dr. Gardner Taylor once said, "Every preacher on Sunday morning needs a rested body and a rested mind." If a person’s body and mind is rested, God can use them to think through them to bring up what that person has been reading. Preaching: Who are your favorite preachers—some who have influenced you and some you enjoy listening to? West: My pastor O.C. Johnson Sr. He has gone on to be with the Lord. I have CDs of him now. I still enjoy listening to him. 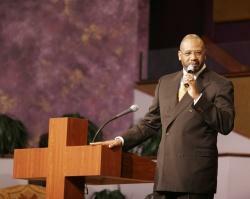 I enjoy listening to my pastor now, A. Louis Patterson. Some of the saints who’ve gone on—Manuel Scott, William Augustus Jones, Miles Jones. I still delight listening to Dr. James Earl Massey, Robert Smith and Joel Gregory. He was my assistant, but he was also my teacher, preacher, and I enjoy Joel. I have a list, and I listen to them for different things. Sometimes when I need encouragement and strength for the journey I’ll listen to somebody like Dr. Massey, who’s always challenging and always encouraging at the same time. Robert Smith’s the same way, you know. And so I have a long list. I like to listen to the past masters. I enjoy that. I got some tapes by George Truett. I’d never heard him—just read some. Oh, but man, I tell you, now I’m a fan of Truett! I enjoy listening to him. I came across some of James Stewart’s and George Buttrick’s old sermons, so I’ve tucked them away. I’ll periodically listen to them. Preaching: I think you learn so much from listening. I think, "Wouldn’t it be wonderful if we could have somehow captured tape of some of those great 19th century preachers like Spurgeon, Phillips Brooks, Beecher, Broadus?" West: I knew you were going to say that! If there was any era that I could be transported to, I would love just one time to be in one of the Tabernacle services to hear Spurgeon or Parker. The 19th century has given us a thesaurus of preaching insight. I really believe that. I think the 19th century might be the epitome of preaching. Preaching: Do you have a favorite passage that you enjoy preaching more than any other? West: My favorite passage is Philippians 1:6. I really love that passage. I just wrote a sermon on that, "The Gospel of the Good Finish." Everything God starts, God finishes. You’ve never seen God do a half anything. I love that passage. I told them when I lay down for the last time, center my whole home-going around that passage. God begins it. He’ll continue it. He’ll complete it. I believe that. Don’t get me started!